Thousands More Heat Deaths from Record Heat Wave in Pakistan on top of Neighboring India’s nearly 2,200 heat deaths. Unclaimed heatwave victims in Karachi on June 26, 2015. Hot and humid weather came to Karachi Pakistan just weeks after torrid temperatures caused nearly 2,200 deaths in neighboring India, raising fears that South Asia could be seeing some of the devastating effects of human-caused climate change, the Associated Press reported. The worst of the heat peaked Saturday, when the high temperature hit 112.6 degrees in Karachi; the heat index topping out at a dangerously high 121 degrees. “The deadly heat wave that has killed several hundred people in Karachi, Pakistan, is clearly a harbinger of things to come with the changing climate,” Saleemul Huq, director of the International Center for Climate Change and Development in Bangladesh and a prominent climate scientist, told the Associated Press earlier this week. The death toll in Pakistan’s deadliest heat wave on record now topped 1,100, causing morgues to overflow, Reuters reported Friday. 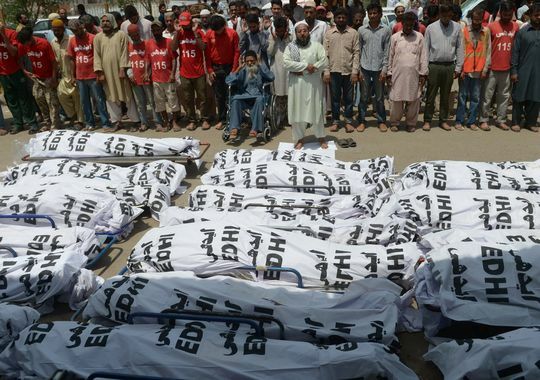 “By Friday, at least 1,150 people have died in the government-run hospitals,” said Anwar Kazmi of the Edhi Foundation, a private charity that runs a network of ambulances and morgues. The New York Times reported the heat wave has sent more than 14,000 people into government and private hospitals in Karachi, the nation’s largest city. The hot weather comes just weeks after torrid temperatures caused nearly 2,200 deaths in neighboring India, raising fears that South Asia could be seeing some of the devastating effects of human-caused climate change, the Associated Press reported. Pakistan’s previous deadliest heat wave was in 1991, when 523 people died, EM-DAT, the International Disaster Database, reported. The worst of the heat peaked Saturday, when the high temperature hit 112.6 degrees in Karachi; the heat index topping out at a dangerously high 121 degrees. “Since the monsoon has been slower to get into northwestern India, Karachi has been tremendously dry with intense heat,” stated AccuWeather meteorologist Anthony Sagliani. Cooling monsoon rains are likely to arrive in Pakistan by mid-July, which should mean the region won’t see any more temperatures this summer as high as were recorded last weekend, meteorologist Jeff Masters of the Weather Underground said. The Pakistan heat wave will join this year’s heat wave in India as one of the 10 deadliest in world history. “Even if this particular event cannot be unequivocally attributed to human-induced climate change, we can certainly expect such heat waves with greater frequency in future,” he said. There is widespread scientific consensus that climate change generally makes extreme weather events such as flooding, droughts, and heat waves much more frequent and more intense. A major report this week from The Lancet finds that climate change significantly increases the fatal risks of these types of events. The report, which was backed by the World Health Organization, diagnosed climate change as “a medical emergency” with the power to undo 50 years of progress in global health. In a landmark document released last week, Pope Francis aimed to focus the world’s attention on the matter of how climate change impacts the poor. “Climate change is a global problem with grave implications: environmental, social, economic, political and for the distribution of goods,” he wrote. According to NOAA and NASA, this year is on track to supplant last year as the warmest year on record.